Solar Surveillance & Lighting - Wanco Inc. 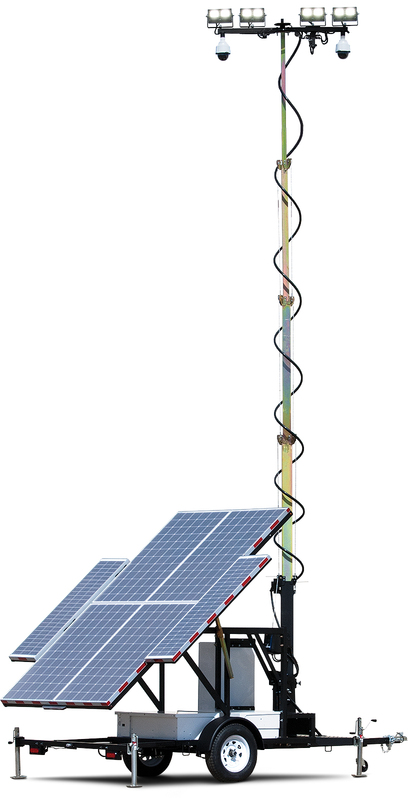 The Wanco Solar Surveillance & Lighting System is high-powered for long deployments in critical applications. Well suited for border protection, oil & gas operations and remote sites. Cameras and lights top a 30-foot mast and operate independently and autonomously. Wanco’s Solar Surveillance & Lighting System features a 30-foot tower and lots of power, with a large battery bank and solar array. This system’s day/night cameras capture high-resolution video that can be viewed locally or remotely in real time or recorded, while its ultra-bright, high-efficiency LED lights illuminate a large area. The lights can operate manually, or automatically from dusk to dawn. Adjustable settings let you decide how long the lights stay on, and the lights and cameras can operate independently or simultaneously. Two battery banks provide extended run times. The system can operate autonomously for long periods with sufficient sunlight. A large solar array keeps the batteries charged.